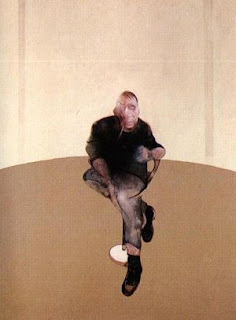 "The job of an artist is to deepen the mystery" this quote was said by then charismatic , unapologetically gay and borderline alcoholic Francis Bacon. Considered to be one of 20th Century's greatest artist for his disquieting of the human condition back then and his grotesque but oddly beautiful masterpieces. Also his artwork -"Three studies of Lucian Frued" smashed the record then for the highest painting of auction to be sold at $142million before being beaten by one of Picasso's works in May 2015. Out of his wide collection of dark and crucixion inspired artworks , I have picked 2 to share with you today. Painting from triptych "Study for self portrait"
I consider this artwork to be a retreat from the bold and experimental paintings of his. Drawn in a sorrowful atmosphere ( after many of his close friends passed on ) it is an awknowlagement by Bacon of the effects of age and time on the human body. Details were from a passport as Bacon hated to see his own reflection. Tired of fame , Bacon begins to appreciate simplicity ( note that in Bacon's early works he often hides figures behind concealment but in this particular painting he doesn't ). I love this artwork not only for the beauty of it but the more calm feel towards it which is rare in Bacons collection of triptych and other artworks. As you can see oil painting was used to create this art wonder. The skillful blending of colours is just magically , such blending(s) cannot be achieved by art "noobs" like me. The other two paintings part of the triptych is also wonderful beauties and I truly recommend to check them out yourself on our favourite search engine Google. Triptych "Three studies for a crucifixion"
In the year 1944 , as a bloody war took place Francis Bacon ruthlessly painted a triptych showing what I see as morbid creatures or mangled bodies. Although I do not know the true meaning behind this artwork , I believe that Bacon was trying to depict the horrors of war in this artwork , given that the horrific triptych was painted during WWII. Francis Bacon have done an awesome job with the fresh flesh of the disfigured bodies , with light reflecting off the literally bared muscles. Edited some typos , sorry for the typos readers.And for phone users sorry for the stretched photo of "Three studies for a cruxifixion" in the blogger app version.